When the United Progressive Alliance (upa) triumphed at the hustings exactly a year ago, both its supporters and detractors agreed the victory vindicated the government’s social welfare schemes. The upa, in its first avatar, brought a new lease of life in many areas of the social welfare sector. It discarded moribund state-centred approaches, involved local communities and tried to draw in the private sector. Take health insurance, for example. Andhra Pradesh ruled by the upa’s biggest constituent, the Congress, has a health insurance scheme for people below poverty line—Aarogyasri. The scheme which allows cashless treatment in private hospitals is doubtless a fresh idea in a country where the poor are left out from the benefits of insurance. The scheme has come as a manna from heaven for coporate hospitals. 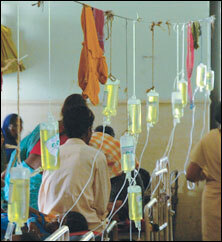 With the government bearing the financial burden of treating the poor, corporate hospitals are assured of patients. All this would have been fine, but for the uneasy relationship between private profit and social welfare. Assured that the Andhra government would reimburse their institutions for treating the poor, doctors at corporate hospitals now talk only of expensive procedures. This could still have been just another case of corporates fleecing willing government, if some of the treatment procedures in question were not well outside the medical protocol. In Andhra Pradesh young beneficiaries of Aarogyasri are talked into getting an hysterectomy when they visit private hospitals for abdominal problems. Some of these women are barely into their 20s (see p38). It is well known that removing the uterus at such an early age leads to several medical complications. What good is health insurance if it opens the door to ill health? there is something disingenuous about the private seed industry when it resorts to free market principles to argue against government controlling seed prices (see p9). It creates the impression the government is stifling entrepreneurs who have invested their time and research to make available high-yielding seeds to farmers. There are several questions the seed industry must answer before staking its claims, beginning with the source of the genetic material they have used to create their products. Over the past four decades, the Indian Council for Agricultural Research created many varieties of crop through one of the biggest efforts of its kind in the world. It made its work freely available to farmers as well as private companies. Private companies have sold these —or hybrids created by tweaking them around—to farmers at several times the cost. This is especially true in the case of cotton. The claims of private research are mostly myths, because companies never reveal their sources. There is another reason for seed price control. Supporting the Indian farmers with services and products of its research, the government could control food prices; farmers earned enough even when prices were low, because their investment was even lower. If prices of seeds are going to be dictated by the market, prices of agricultural commodities, too, must be left to it. Can India handle inflation in food prices? The free market arguments are derived from Europe and North America, where heavily subsidized farmers can pay seed companies. Bt cotton seed prices fell from Rs 1,800 a packet eight years ago to about Rs 650 now—and they haven’t yet gone out of business. The government must remember it represents interests that are wider than that of private seed companies—affordable and nutritious food for its citizens and a decent life for its farmers.